Let’s say you’ve got a nice, growing network on LinkedIn. Hurray! Now let’s say that it’s gotten large enough that you’re unsure of how it’s all trending. After all, what if your network is dominated by people who used to work at Fidelity but you want to get into Prudential instead? How can you see how things are shaking out? Or maybe you want to get a handle on job titles that you’re seeing – what if most of your network consists of tradespeople in your area, rather than people who might actually be able to find you something? If you’re an accountant, a network full of hairdressers and landscape contractors is lovely but it might not be really doing it for you, eh? Here’s where InMaps came in. Essentially, what LinkedIn was doing is, instead of geographically mapping your connections, they were mapping other meaningful relationships among all of those people. So instead you could see things like job titles that frequently come up, and other connections. These included who used to work where. If you’d worked in several places (like I have) you might have seen one former employer dominate, particularly if you’d just left a particular role. After all, when Hachette Book Group and I parted ways, suddenly I connected to the other seventeen or so people who were being outsourced. There was a bit of urgency to getting connected, and we wanted to maintain friendships. I’d had to dig a bit in order to find former colleagues further back in my career. And, by the way, FYI, this does behoove one to try to make connections. These connections would be both during employment and to reach back to older connections. This is because the natural push to connect might not come about if you’re thinking about a job you held twenty years ago, long before LinkedIn existed. It would take a while for LinkedIn to generate an InMap. Particularly if you’ve got a lot of connections. This was a feature that never really got out of Beta, so that was totally understandable. But here was the InMap for a woman named Leslie Gotch Zarelli. So this should give something of an idea about how the overall pattern looked. Her InMap (I would have posted mine, but LinkedIn never generated one) was dominated by general areas like Legal. Plus she had probably a former employer or two, and what appeared to be some job duties. More information was here. LinkedIn discontinued the service in 2015 and never really replaced it. So your contacts now are static. A pity, as it was a great idea. 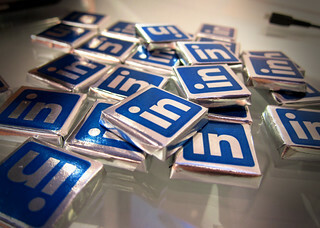 LinkedIn – people want this! Get mappin’!